Very low interest rates have been with us for nearly a decade. There are strong arguments to justify their use. But that doesn’t mean we have to like them. In trying to address various ills, low interest rates may cause their own problems. I think there are signs that politicians and central bankers are getting more concerned about these downsides. Prompted by readers, I’ve looked before at how and why rates got so low. Today we’ll consider the fallout. Let’s keep things simple. This is a thorny issue, and as prone to myths and crank theories as, say, gold. Often from the same people! So for the record I don’t think low interest rates are a conspiracy to defraud the middle-classes. Whisked forward in a time machine, I suspect 2009’s central bankers would be surprised to find rates still at 0.5% or lower in the UK, the US, and Europe. But what else were central bankers to do? With low rates and quantitative easing (QE), they’ve used a limited tool set to salve battered economies. Elsewhere political leadership has been notable by its absence. Regulators have often made things worse. Outside of London house prices, there’s been little sign of inflation. There have even been deflationary scares. It’s not like bankers kept rates low in an overheating economy. So I’m not going to rant about the motives of central bankers. Instead let’s take a tour of the problems the low rate strategy may have caused, and that may prompt a rethink. If you’re under 25, you might wonder what I’m on about when I say ‘low interest rates’. Aren’t interest rates always close to zero? Am I thinking of how the Bank of England recently halved its rate to 0.25%? We need to look further back that that. It is true rates have had an inferiority complex for years since the financial crisis. But as recently as 2007 you could still get 5% on your cash savings – and much more if you shopped around. Also, this topic goes further than the rates paid by High Street banks. In part one we saw how central bank rates influence the yields on investments such as government and corporate bonds. But investors who buy and sell such bonds on the open market also influence their yield. Remember how to calculate yields? As investors bid up the prices of bonds their yields fall, and vice versa. So bond yields are set by supply and demand from the whole market. Now here I’m already straying into disputed territory. Those who doubt the efficacy of today’s bond market point to central bank manipulation. 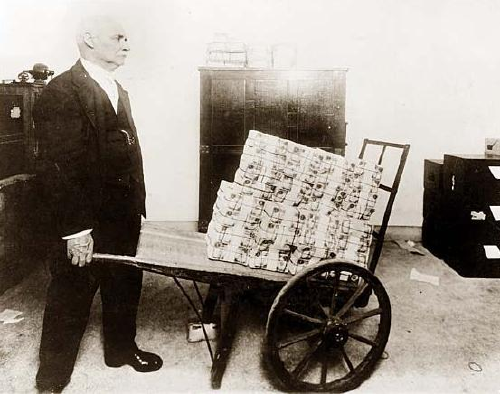 Central banks have bought huge quantities of government bonds through their QE programmes. They are distorting prices and yields. Indeed, the point of QE is to lower market yields! All this central bank buying does complicate talk about market-driven rates. But pension funds and commercial banks do influence yields through their trading activities. Central bank rate setting and bond buying is only part of the picture. (Albeit a bit like a cartoon of an 800-pound gorilla sprayed onto a Gainsborough by Banksy). Yields would rise if the bond market revolted against central banks and stopped buying. It’s hard to buck central banks, but it’s not impossible if their actions are at odds with reality. So in buying and holding low-yielding bonds over the past few years, investors may be agreeing that low rates are appropriate. On the other hand, banks, pension funds, and others don’t have much choice about government bonds. They’re required to hold them for regulatory reasons. They also knew central banks would be big, price insensitive buyers. Whatever their own views about the wisdom of high prices and low yields, it might have made sense to buy anyway. I don’t want to go too deep into the weeds here. Just know that all kinds of buyers and sellers – both domestic and foreign – influence bond yields. Central banks respond to these yields, as well as looking to influence them. In part one I featured a graph tracing 5,000 years of ups and downs in interest rates. Much of that chart was guesswork. We can be surer of recent history. Bond prices and yields represent the wisdom of uncounted bankers, traders, and investors. At $100 trillion, the global bond market is bigger and deeper than the stock market. Its gyrations are well documented. 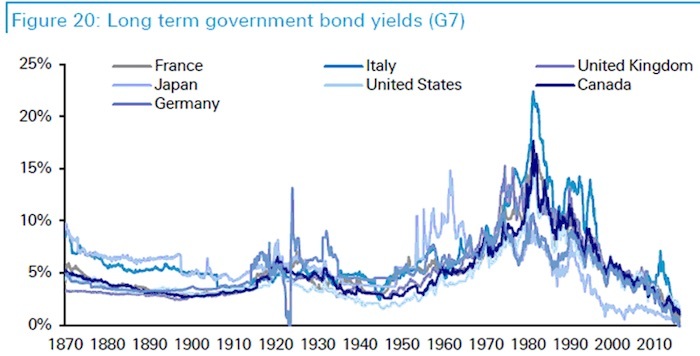 A century and a bit of global government bond yields. You can see government bond yields in the advanced nations are at historic lows. Whatever this situation we’re in represents, it’s unprecedented. Let’s consider some of the potential problems it may be causing. Some question the moral overtones of casting savers as the good guys and debtors as the bad. But most of us believe prudent saving is the more responsible choice. Yet consider the lessons of the past 10 years. Low rates hit savers hard. But they enriched those in debt – whether companies, spendthrifts, or mortgage holders. Meanwhile lifelong pension savers faced plummeting quotes when they came to buy an annuity. The pension freedoms that sought to address this were welcome. But many pensioners would have preferred a safe and reasonable regular income. 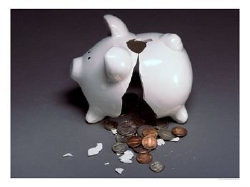 As for cash, banks have slashed the rates of even their best savings accounts to below 0.25%. The Sunday Times recently reported that customers with less than £25,000 in their Natwest cash ISA get a rate of 0.01%. Invest the full £15,240 at the start of the year in that ISA and you’ll make £1.52 in interest. Save monthly and you’ll earn 83p! The financial crisis was all about reckless lending and borrowing. Has the decade of near-zero interest rates that followed it educated people to save or to spend? The lack of a return on cash and other safe assets isn’t a case of money illusion. Money illusion refers to how we tend to think of currency in nominal rather than real1 terms. When we look back at the higher returns from cash in the past, we may forget that inflation was also higher. But this tendency doesn’t excuse away today’s lousy returns from cash. Yes, inflation is low. But interest is nearly non-existent. Real interest rates are negative in the UK. Negative real interest rates mean your cash shrinks in value every year. True, there are various ways to eek out a higher return. You can use regular savings accounts or current accounts with various hurdles. Peer-to-peer lending offers higher returns, but they come with much more risk. The safe quirky cash options don’t scale. 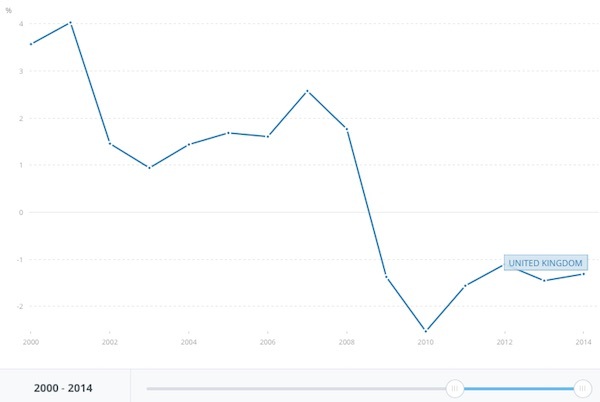 Anyway, the World Bank data above shows the average rate earned on cash. Whatever you’re doing, most people aren’t moving cash around the best accounts. Their cash is languishing in accounts that erode its spending power. This relentless shrinking is not normal. The long-term real return from cash is about 1%2. That’s not massive, but it was something. For government bonds, the picture is more complicated. 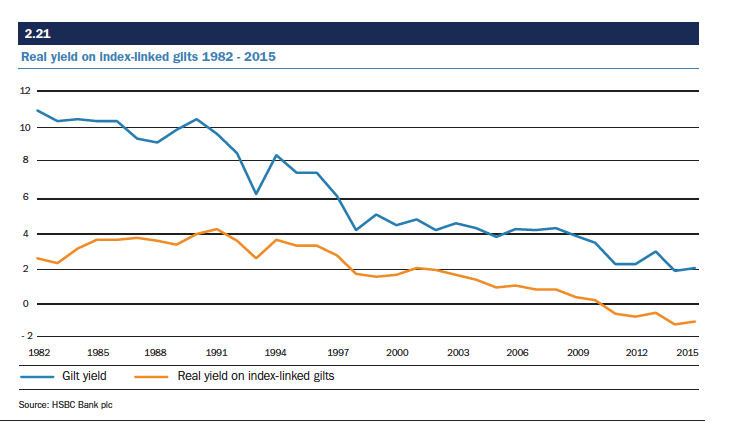 The long-term average real return on UK gilts was 1.3% over the past 116 years3. But investors did much better in recent decades than history or theory would suggest. UK government bonds actually beat shares over some lengthy periods ending in recent years. Such long-term out-performance makes no sense given bonds are much safer than shares. As interest rates plunged, bond prices soared. This delivered high capital gains, which for long-term holders made up for shrinking yields. A 10-year government bond today sports a yield to maturity of around 1%. In contrast, when the FTSE 100 first breached 7,000 at the turn of the century, the same bond paid 6%. The investing world has been inverted. UK investors now buy equities for income and have seen capital gains from their bonds. But the Bank of England expects inflation to head above 2% in the coming years. Buying a 10-year government bond today seems to all but guarantee a negative real return. There’s actually not much sign of this – savings rates in the US and the UK have been trending lower. But in theory, if people don’t believe today’s low yields will growth their wealth enough, they may compensate by saving more. That’s fine on an individual level. (In fact I was encouraging it just the other day here on Monevator). But if you’re a central banker implementing low rates, it is counter-productive. You’re trying to get money moving again through the economy. It’s worth saying that the household savings ratios are so broad they might not give us a true picture here. Interest rates are puny. Locking in a 1% bond yield is about as attractive as buying a timeshare in a termite-infested tree house. Many investors have instead sought higher returns. They’ve bought corporate and high yield bonds, property, shares, and other assets. They have ‘moved along the yield curve’, in other words. This may well have been prudent – and it’s what central banks have been trying to get us to do. In theory it means less money sitting in cash and more money invested in more productive assets. Yet with those higher potential returns come greater risks. This is true, whatever your motivation for seeking yield. 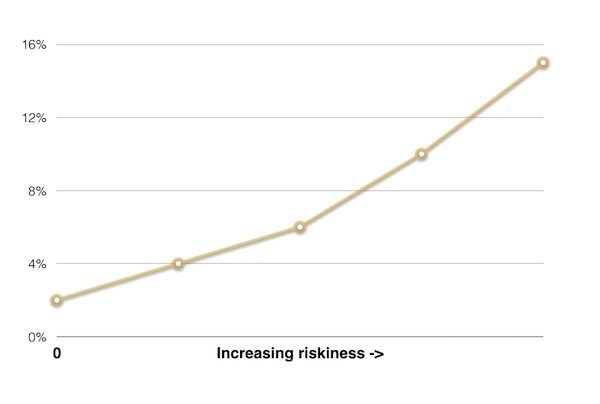 The following graph shows how riskiness increases as potential returns increase. 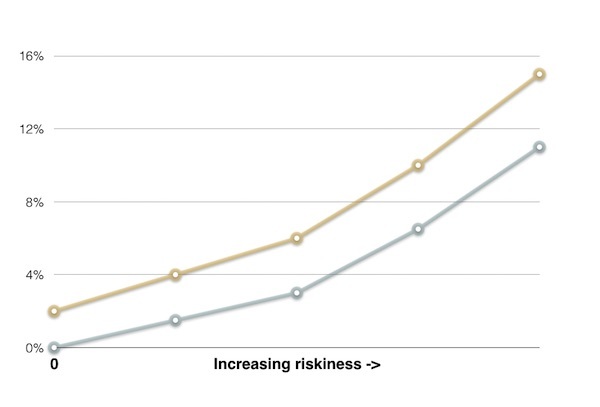 As we move into riskier investments (x-axis), potential returns increase (y-axis). 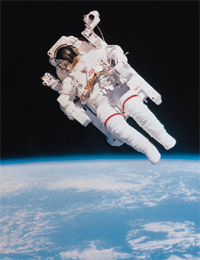 Imagine we now pull down the left hand end of the curve. We do this to reflect how the returns from cash today are near zero and bonds not much better. In response, teed-off investors move along the curve seeking higher returns. As they do so their incoming money bids up the price of assets and pulls down yields. The grey line represents how likely returns are lowered across the yield curve. Readers tell me they’re putting all their money in shares because cash pays “nothing” and bonds are “guaranteed to lose money”. If you hold more shares because you can’t stand the prospect of a 1% yield to maturity from gilts, I think that’s understandable. I’m similar. But you must do so understanding shares are still riskier. They can still crash 50%. And their returns will likely be lower than in a world where bonds were yielding say 4-6%. Ignoring this is what we mean when we say low interest rates may have encouraged people to take on too much risk. It’s not just you and me finding it hard to make profitable investments these days. Slow economies and low inflation makes it hard for companies to make good returns on capital. One solution is to use cheap debt to juice up the lowly returns from a ho-hum investment. I won’t go into the maths here. Suffice to say a project that delivers a 6% return on capital is more exciting when funded with debt costing 3%. This is one of those It’s Complicated issues. But the summary is a lot of low-quality debt-fueled expansion may be taking place. Some believe companies’ enthusiasm to buy back shares and pay dividends despite low growth may be part of this phenomenon, too. The FTSE 100 saw its total dividend payout uncovered by earnings in the early months of this year. That hardly fills one with confidence. (I suspect the post-Brexit weakness of the pound might have boosted foreign earnings enough to plug the gap for now). Low interest rates mean some indebted companies that would have gone bust don’t. Instead they limp along meeting the low interest payments on their debts. So what? It’s rare anyone high-fives news of a company closing down. So what? It’s rare anyone high-fives news of a company closing down. Many are aghast at a retail chain closing or a steelworks shuttering due to the job losses. Well, such closures are grim for those individuals involved. But from a macro-economic perspective, it’s vital bad businesses fail. We want capital to flow to the better companies – those that have discovered more efficient ways to deliver the goods and services we need. This is how productivity and innovation improves all our living standards. It’s also how capitalism rewards entrepreneurs and investors for their risk taking. Zombie companies clinging to markets, facilities, employees, and capital slow down creative destruction. This is one way low interest rates could be prolonging slow growth in the developed world. It was worth avoiding a global depression in the wake of the financial crisis through low rates. But do we want to drag the pain on for decades? Fair warning. Whether low interest rates hurt bank profits – and zero interest rates flatten them – is a thorny topic. Indeed if there’s a Fight Club where analysts go to let of steam, then this is the topic that gets them pumped up. I’ve grappled with this in my own stock picking. Resolving the debate is well beyond the scope of this article. Suffice to say that if you want to know what the market thinks about it, look at US bank share prices. They go up when it seems the US Federal Reserve is about to raise rates, and they slump when it doesn’t. Let’s say for the sake of argument that low rates do hurt bank profits. Again, you might argue, who cares? Nobody likes a banker these days, right? But it’s a bit like the waste pipes heading out of your lavatory. You might not like to think about it, but banking is the economy’s plumbing. All kinds of bad things might happen if normal banking profits aren’t possible. If banking is broken, more money might flow into the so-called shadow banking system, or into peer-to-peer lending. These areas are not be so well regulated. Their growth could introduce instability into the financial system. Let’s not forget the low rate policy began with trying to restore financial stability. If banks can’t make profits – if they struggle to attract capital – they can become a source of instability. Successive waves of drama on the continent have demonstrated that. To show my hand, I have a hunch central bankers worry about bank profitability. I think this may be what reverses the march into zero interest rates. When the ECB last cut rates, it included measures to support bank profitability. It wouldn’t have included them if it had no concerns. There are signs that Japan’s central bankers may be reaching the same conclusion. This one is a bit more obscure, but it could prove relevant if low rates persist for a long time. If insurers can’t make an adequate return from the bonds they must invest in, then they may withdraw from the market. Alternatively, they may introduce charges that make their products bad deals. Teetering insurers would not be good for financial stability any more than shaky banks. If insurers can’t provide the services we need, we might decide to self-insure instead. This takes us back to that potential for excessive savings. It’s also inefficient. It’s more burdensome to insure your own liabilities (or those of your company) when the costs and risks are not widely shared. Insuring your health, life, and property more efficiently is one of the benefits of capitalism. On a related note, low yields are causing big headaches for pension funds. Low yields make it hard for pension funds to match their assets to their future liabilities. If real terms payouts from bonds are low, then a scheme’s investment in bonds won’t go so far in meeting the payouts promised to pensioners. This problem reached its apex when gilts soared (and hence yields fell) in the wake of Brexit. “A rush for safe-haven bonds around the world has sent the yields on sovereign bonds through the floor – meaning a fall in the regular income that pension funds use to pay their retirees their defined benefits, sometimes known as final salary pensions. As I’ve said, I don’t believe low yields are due to central bankers alone. 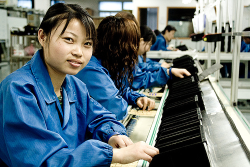 Factors such as regulation, demographics, technology, and globalisation are in the mix. Yields were falling before the crisis, and pension deficits are nothing new. But I do think the low rate strategy of central banks has put the boot in. To the extent that the policy may be up for a rethink, pension schemes in crisis seems a likely motivation. This article is a monster, and this final point could amount to a series of articles in itself. So I’ll be brief. Low interest rates may be influencing – or distorting – the valuations of all assets. This is not just because of the “reach for yield” I discussed above. It may be rational for a given investor to pay more for an office block, a factory – or a global tracker fund– when rates look likely to stay lower for longer. But a further problem may arise from plugging low yields into asset valuation models. Discounted cash flow models try to estimate the cash due from a company or property. They then compare this to the yield you could get from the lowest risk asset – a government bond. Plug a historically low risk-free rate into such a model and you can get extreme valuations. It’s possible to argue that everything from shares to housing is cheap. This would strike many people as pretty odd. Other metrics suggest valuations are at least fair. And instinctively we doubt that low interest rates will persist. Yet there could be even deeper problems. As the name suggests, a discounted cash flow model puts a discount on the future cash due. This reflects the uncertainty about future profits, as well as inflation and interest rates. Normally, distant payouts are deeply discounted. But with the risk-free rate so low that doesn’t happen so much. Because uncertain future forecasts have grown in importance compared to near-term cash flows. A discount rate of 2% doesn’t have much impact until you get far out. This makes the present value of an asset even harder than usual to determine with confidence. Because future cash flows assume greater importance, the valuation is based on more finger-in-the-air guesswork. It’s a nerdy-sounding but important point that may mean market valuations are wildly off. Even a modest rise in rates could cause a crash in all sorts of assets beyond what we’d expect. Or it might not. Markets are not stupid, and they may have taken this into account. Time will tell. I hope this long romp gives those who asked for it an idea of the problems low interest rates may cause. How will they be unwound – and what are the consequences for our portfolios? That’s the $100 trillion question. I stressed in part one that people have got egg on their faces for years trying to call the top of the bond market. (That is to say, the bottom for yields). But I hope it’s clear that if yields do rise sharply, a fall in the value of your government bond fund could be your least concern. If there is a bond bubble, it’s probably also reflected in equity, property, and other markets. So swapping all your bonds for shares might be a case of jumping out of the frying pan and into the fire. Then again, the long-term potential from shares, say, does look much better than from bonds. 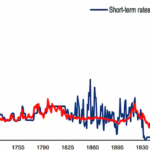 Government bonds are on historically tiny yields, which point to low future returns. But you must buy shares knowing you have the stomach to endure steep stock market crashes. If you can accept that, equities may be much better value than bonds. A diversified portfolio will be the best pragmatic response for most. That means owning cash, bonds, global equities, commercial property, and perhaps some gold. ‘Hero’ bets on one asset or another make for good articles and spunky anonymous blog comments. But we’re deep into unknown territory and we may be at a turning point if central bankers are having a rethink. I think a bit of humility might be a wise investment. John Mauldin recently did a series of articles about central banking and interest rates (bringing up many, if not all, of your points above). It did not have a good outlook, as he pointed out that some of the Fed guys have penned papers where they could imagine -11% interest rates being optimal for the US economy. And a lot of what is public about some of the topics at Jackson Hole revolved around negative interest rate policy. It looks like central bankers may be about to double down. Low and negative rates appear to be becoming an article of faith for central banking rather than a temporary fix. Meaning the ensuing bubble burst may be even more painful. 11) Fuels a Housing boom. Now you might argue this is contained within (10), but most house buyers aren’t looking at a sophisticated asset value analysis, they are comparing a mortgage payment with net income. If households are prepared to commit 50% of net income to housing, low rates mean high prices. And these unsophisticated investors are a big worry to politicians, as its much harder to give them a haircut compared with equity or bond investors, because they both bleat and vote. Thanks for such a comprehensive review of this issue. It will deserve re-reading and a lot more thought before I grasp all the implications. One thing that did pop out for me though was your point 10 “Plug a historically low risk-free rate into such a model and you can get extreme valuations. “. I’ve become aware of this in my own efforts at planning future income, and it is a real pig. When the expectation is a nominal return of say 7% using a planning variation of say +/- 2% seems reasonable, but if expectations are 3.5% the same 2% absolute variation produces dramatically different outcomes. Unfortunately I think using the absolute variation value is correct and scaling it down with the return expectation can’t be justified. But maybe I’m wrong. From what you are saying more generally though, I might be worse than wrong and uncertainty of returns is increasing relative to where we were a decade ago. Gah. I think the stock market is inflated because instead of putting money into a savings account or money market account or some other guaranteed interest instrument, people are now having to go to more risky investments to get a return. Since more money is going in than out, we’ve had a nice long run in the stock market, but it seems like it can’t go on forever, and at some point we may look back and call this somewhat of a bubble. This is something I hear a lot and it *sounds* right, but I’m not at all convinced it *is* right. While stock prices have been going up, mutual fund investors have been fleeing their funds… there were net cash outflows in U.S. domestic equity funds every month from March 2015 to August 2016. While it is difficult to pin down precisely why these outflows have been so persistent, it is clear that current conditions have made holding equity funds considerably less attractive relative to other assets. I think it’s possible the market has become overvalued for the reasons I cited in the article, but I think it’s the same (or fewer) investors bidding up prices, rather than a huge mania of new money surging into stocks, personally. In fact the lack of huge fund flows into equities over the past few years is one of the reasons I’m less pessimistic than many about stock markets, even to some extent in the US which looks by far the priciest market. @IanH — Cheers! It’s something I’ve been thinking about a lot. DCFs are not my favourite at the best of times (Garbage In, Garbage Out, as my dad — and old programmer — used to say) but they are so widely used I do believe this could be significant. @John B — I agree it increases the capacity to carry heavier mortgage loads, and as you say, that low rates might be factoring into overvaluation calculations. However both in the UK and US regulation is much tighter than before the crisis, and in the UK mortgage lending is still subdued. There’s also very low rates in Europe, but no housing boom. @James — I think central banks are backing away from negative *nominal* rates, personally, as I mention above. However there does seem to be some growing talk about accepting even more negative *real* rates. The BOE is talking openly about looking through higher inflation and not raising rates, and some Fed officials have talked about letting the US economy (and presumably inflation) run ‘hot’ for a period, without raising rates much. Seems like RateSetter have discontinued their £100 sign-up bonus, so you might want to remove the reference to it in the grey “Offer” box that appears beneath the article. I gather that the refer-a-friend bonus is still in place, so it’s still link-worthy I think. In a tenuous attempt to link this to the article, I guess this means RateSetter is having no trouble in acquiring lenders seeking interest rates higher than savings accounts. Very thought provoking article. Thanks for the insightful commentary, and keep up the good work. The low rate environment makes me wonder what my grandparents would have made of it all, having retired back in the mid 1980s when their term deposits were earning 18%p.a! Subsequently they discovered to their cost that nothing lasts forever, I suspect the same conclusion will prove true of the current low rates. While these are undoubtedly worrying times, they are also morbidly fascinating, with the inevitable inflation working its way into the real economy now, I reckon that next year already we’ll see most people’s real disposable incomes hit. This may matter disproportionately given that most are mortgaged up to their eyeballs on such low rates with little understanding how high that can make monthly payments jump if the central bank rate goes up even a bit. Given that most politicians’ main aim is just to stay in power, the knee-jerk policy responses by the regime of the day is not encouraging, so pondering their reaction to a significant % of the electorate panicking about their mortgages is nightmarish. I personally know several people who still have interest-only mortgages and had been enjoying negligible payments for years now, but have no idea how to pay back the principle on their liar-loans and more terrifyingly for them little understanding of what their monthly payments could escalate to with inflation at say 4% in a couple of years time. A great summary of the risks associated with the low-for-long interest rate environment. Recent rhetoric from various central banks does seem to hint that, while we may not be at the end of easy money, we might be at the end of “ever easier money”. The gains seem ever more limited when weighed against the costs. Perhaps it’s time for higher inflation targets (reversing the Volcker disinflation paradigm) and fiscal policy to take up the challenge. Of course central banks have tried to hand that baton over before and some event has forced them to revert to ever more unconventional forms of monetary policy. This could just be another head-fake. I’m of the opinion that any rise in long-dated bond yields is a problem for most asset classes. The discount factor effect seems real enough. It’s not as though stock markets went up due to above trend growth or productivity and it’s hard not to look at a chart of the returns generated by long-dated gilts and property over the last 30 years and not see some correlation. If ever lower bond yields helped drive greater positive returns in all asset classes, the reverse is likely when they rise. This doesn’t imply that other asset classes crash, since their can be offsetting factors in reflation, but we might see sub-par returns until bond yields normalize. Correlations between all asset classes could also be high, reducing diversification benefits. The current very low level of volatility would rise if the ‘Yellen put’ is struck somewhat deeper out-of-the-money. I do hold central bankers responsible. I would also point out that the bond manipulation is so large as to swamp any other investor, fully 1/3 of the UK national debt has been bought by the BoE who simply magiced the money up. The other major economies are the same. Someone sold them those bonds, they were not allowed to buy them directly from the issuer, we enriched the establisment. Where did the money then go? Eventually into equities – so my hunch, though not held strongly enough to sell 🙂 is that the money will be destroyed when convenient by a massive stock market correction. The sheep (smiles – those that voted to remain are in my book the sheep and being fleeced is what they deserve) will sell and lose their shirts. But we’ll all suffer at least on paper. A good post, I enjoyed it. I get worried talking to people in their 20’s at work who think the current level of mortgare rates is normal and here to stay permanently. They look at me like I am some sort of dinosaur when I tell them the interest I paid 25 years ago on my mortgage. From a personal perspective having some index linked National Savings Certificates that pay RPI inflation + 0.01 % (get the size of that real return!) helps me sleep when all markets seem to be fully valued. Just reading article about that El-Erian guy who has 30% of his own money in cash at the moment, and discussing the way stocks and bonds could fall in tandem which will screw anyone relying on the good old 60/40 portfolio or thereabouts. So adding cash, gold and real estate as part of your asset allocation is the only way to be considered fully diversified. You can always shorten your bond duration, but too much and then it essentially becomes the same asset class as cash or money market funds anyway. I think a significant proportion of the UK public with money looking for yield are ploughing into property rather than the stock market, as it seems to be built in to the British psyche that you can’t lose with housing. I’m not so convinced about that with all the moves against BTL and the general illiquidity of the asset class, so I’m actually expecting (or maybe hoping for?) a big transfer from BTL into shares. These things appear cyclical, and IMO UK housing is due a huge correction. Property in the UK is really interesting because it’s a relatively unique (locally-distinguishing) fetish, the conventional wisdom among the educated or not alike is that it’s the nearest to a guarantee that you get to here in life apart from death. (I can’t include taxes, because the rich don’t have to y’know, do it) So, what’s the evidence? Well, the political establishment will ensure Big Business’s bidding in keeping prices up because it’s win-win, in that the middle-classes keep voting for them and later they can get good jobs in Big Business later, if/when they’re ever turfed out. So whatever flavour it takes, (buy-to-let or whatever the scam of the times chooses to call it) in the mid-long term, property will see you right because the system really is rigged to reliably produce exactly that result. From the view-point of the investor though, it’s better not to put all your eggs in one basket with just the one buy-to-let or second home on airbnb, because that’s too risky, like putting your entire lifesaving’s into one picked stock. It’d be better to hedge the risk by spreading it across a property fund for example, the tax bribes for the rich will still apply, just in nominally different form (name) to buy-to-let. When they close a loophole in a budget, you know they’ve immediately opened another to look after their own; you just need to find it. Buy-to-let has become too obvious, so they’re moving on. Acquaintances I know are letting out their rental properties as airbnb instead now, you can make the same yield for a year in a few months, while avoiding the spotlight of opprobrium; plus ca change & all that. We bought our first house in Grenoble when I got a job there in 1991. The bank offered us a fixed rate at 10%. Luckily I talked to my Dad who know more about this, so we went for a variable rate…thank goodness! Back in the UK c.1998 we must have been the last to buy a house under the old rules where we had to prove our income and only borrow what we could afford etc. One year later….Remember the glossy credit card ads falling through the letter box … silver, gold, platinum…black etc. The writing was on the walls but we knew nothing. PS Just heard that the Discussion forums at TMF are closing in a few weeks. If you have tears, prepare to shed them now. When will you sheeple learn? Or it’s fundamentally not predictable. @All — Have approved @Merv’s comment for education and amusement, as some people think I make up these characters up. (Will be deleting away from here so if you’re liked-minded please go to The Telegraph website and have a vent). Loved the last two posts and the one on QE too. I know feel much more informed on the subject. Come-on central bankers, justify my decision for me! @TFS — Cheers! We have a massive index-linked bonds article on the way from @TA, which will sort of wraps this unofficial series of long fixed income posts up. An excellent article. So much better than most I read implying you cannot go wrong “in the long run” with shares and property. Tell that to the Japanese. As for what to do about it all, I will continue to draw down and rebalance my 60/40 portfolio, although I will likely continue to reduce the duration of the 40% gilts/cash part. That may well mean lower returns if gilt yields continue downwards, but it offsets the increased duration of my equities, as discussed in the article. As for property investment, one mortgage free house is all the diversification we need. The real returns on my cash/gilts may turn out to be negative for years, but there is little I can do about that. Taking on more equity risk when the expected future returns are lower than in the past and downside risks higher makes little sense to me. I Don’t hold gold either, but I do hold long duration US Treasuries as I consider these to be a much better safe haven. The more I read the more I get a little nervous about not overpaying more mortgage over the past two years. I’m. It old enough to remember the interest rates that abounded in the 70’s but even the thought of them scares me. The weird thing is I am probably in a better position than a lot of people of my age especially in the area I live. So why do I have this fear?! I think all of us real estate investors can be very thankful that we’ve been able to borrow huge sums of money and very low interest rates to live cheaper and see our assets grow with inflation. It is quite an inflation and interest-rate paradox. But after a double Trump victory, interest rates of rocketed higher and I am finally building up municipal bond portfolio to earn double taxation free income. Are there such type of bonds in the UK which you don’t have to pay country or city or municipality income tax? @FS — Sadly, no municipal bonds in the UK. Our equivalent to your states are much less free to raise and spend money — we have no local income or sales taxes (all at the national level) for instance. Domestically, from a government-backed standpoint its gilts (our Treasuries) or nowt. There’s talk of some sort of ‘infrastructure bond’ coming though (similar to what Trump’s team is proposing in the US) that I guess could be a nod in that direction.